A bit of a panic yesterday. We’re in the middle of moving house at the moment, from a rather large apartment without a garden to a large garden with a smaller house. Unfortunately, that calls for a significant culling of our book collection or, if you will, a fortunate separation of the chaff from the corn. I had brought a few boxes of books to a nearby second-hand bookseller’s when I noticed I missed one particular volume – and one of those spine-freezing sensations set in. The book in question isn’t even really a book. 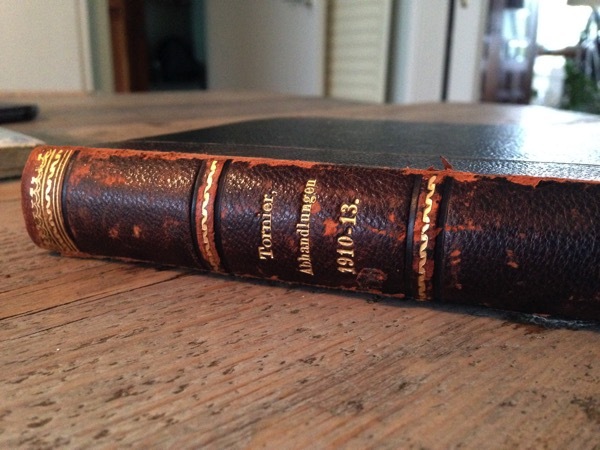 Rather, it is a custom-bound volume of articles by one Gustav Tornier (1858-1938). A zoologist and more specifically a herpetologist1)A zoologist specialized in reptiles., Tornier worked at the Berlin Museum of Zoology (part of the Natural History Museum) around the turn of the 20th century. He was an outspoken character, having risen from wealthy West Prussian landowners around what is now the Polish city of Poznán. This outspokenness showed itself in not always its kindest form when Tornier got involved in a spat over the question how the sauropod dinosaur Diplodocus, copies of which were given to various European museums by the Scottish-American Andrew Carnegie, had moved about while still alive. I will go into that particular topic much more extensively later, but let us say for the moment that Tornier stood his ground in the face of American ridicule, but in a way hardly calculated to favor cross-Atlantic scientific harmony. Tornier is one of the central characters in the book I’m currently writing about those copies of Diplodocus. Working on such a project, you feel a connection with some characters more than others. And over the last three years, I’ve grown rather fond of old Gustav. Reading his work can be a bewildering experience for modern readers, however. Politeness quickly gives way to a style of argumentation of the ‘no prisoners’ variety: scientific issues are central in the discussion, and people are named and shamed if necessary. Part of the intensity with which the Diplodocus issue was played out between the German zoological establishment and others unquestionably owed much to the formers’ style of dicussing issues. Because Tornier was hardly the only scientist to engage in such rhetoric; the practice was widespread in German scientific circles and, insofar as I’ve been able to make out, showed itself particularly popular at the Museum für Naturkunde, where Tornier worked.2)About this phenomenon, you may read Raf de Bont’s excellent article “‘Writing in Letters of Blood’: Manners in Scientific Dispute in Nineteenth-Century Britain and the German Lands.” History of Science LI (2013): 309–35. A good and readworthy example of such ‘letters of blood’ is the rant Tornier projected at his unfortunate colleague Otto Jaekel in 1912. The private sphere is totally different matter, on the other hand. In what little is left of his personal correspondence,3)Some letters in the Museum für Naturkunde Archives, and his personnel file in the Humboldt University of Berlin archives. Tornier shows himself a warm, witty, and congenial man, albeit someone showing an uncomfortable relation with authority. One example that particularly struck me was an exchange with the university regarding a possible pension for his second wife, around 1936. Amidst an onslaught of ‘Heil Hitler”s on the university authorities’ part, the elderly Tornier remains stoic, always the Prussian gentleman but clearly unwilling to conform.4)Found in Tornier’s personnel file, University Archives, Humboldt University. ‘My’ band of articles wasn’t just some volume – it was Tornier’s own collection of his articles, which I picked up (OK, had pick up) in a Berlin used book store three or four years ago. It contains his articles written between 1910 and 1913, encompassing most of his work on Diplodocus, but also treatments of developmental biology, pathology, and scientific organization. Finding it was one those freak occurrences that only happen to you once or twice in your life. And losing it almost seemed like a crime against a friend’s memory. Eventually, my panic died down after it turned up in one of the boxes, buried under four volumes of Brehms Tierleben5)Brehm’s Animal Life, an encyclopedia of animals and a staple of any German middle-class househould’s home library. Tornier was hardly a friend of Brehms‘ mix of fact and fiction, but here’s an irony that would no doubt have made him smile. But more than anything else I’m just glad I didn’t lose it – not in the last place because I might not have survived his posthumous grilling. 1. ↑ A zoologist specialized in reptiles. 2. ↑ About this phenomenon, you may read Raf de Bont’s excellent article “‘Writing in Letters of Blood’: Manners in Scientific Dispute in Nineteenth-Century Britain and the German Lands.” History of Science LI (2013): 309–35. 3. ↑ Some letters in the Museum für Naturkunde Archives, and his personnel file in the Humboldt University of Berlin archives. 4. ↑ Found in Tornier’s personnel file, University Archives, Humboldt University. 5. ↑ Brehm’s Animal Life, an encyclopedia of animals and a staple of any German middle-class househould’s home library.